Manitou’s three new rotating telehandlers — the MRT 2470, MRT 3050 and MRT 1840 — bring the full Manitou MRT Series rotating telehandler line to six models that can handle capacities up to 15,400 lbs. (6,985 kg) and reach up to 103 ft. 4 in. (31.5 m). Manitou's three new rotating telehandlers — the MRT 2470, MRT 3050 and MRT 1840 — bring the full Manitou MRT Series rotating telehandler line to six models that can handle capacities up to 15,400 lbs. (6,985 kg) and reach up to 103 ft. 4 in. (31.5 m). Manitou's new rotating telehandlers fit the performance and safety standards Manitou customers have come to expect in this three-in-one machine. For the contractor, they save time, money and space on the job site. One piece of equipment that can be used in three different modes — telehandler, winch and platform — means more productivity with lower equipment, maintenance and labor costs. Add on the all-terrain capability and numerous attachment options, and these machines are a versatile go-to solution on any job site. Manitou MRT Series Privilege Plus rotating telehandlers come standard with loads of features, including 360 degree cab and boom rotation, frame leveling, fully enclosed cabs, remote control operation, four-wheel drive and four-wheel steering. Another benefit is the industry- exclusive E-RECO system that will detect an attachment and adapt the load chart accordingly, according to the manufacturere. The Manitou MRT 3050 Privilege Plus rotating telehandler is equipped with long stabilizers, extending 20 ft. 6 in. (6.2 m). The stabilizers have pin-mounted strain gauges that determine ground contact and position sensors to adapt the load chart. The Manitou MRT 3050 has a maximum load capacity of 11,000 lbs. (4,990 kg), lift height of 97 ft. 9 in. (29.8 m) and forward reach of 84 ft. 8 in. (25.8 m). Pushing the limits in lift and weight capacity, the Manitou MRT 2470 Privilege Plus not only has the most weight capacity in the product line, it is the highest in the market at 15,400 lbs. (6,985 kg), according to the manufacturer. 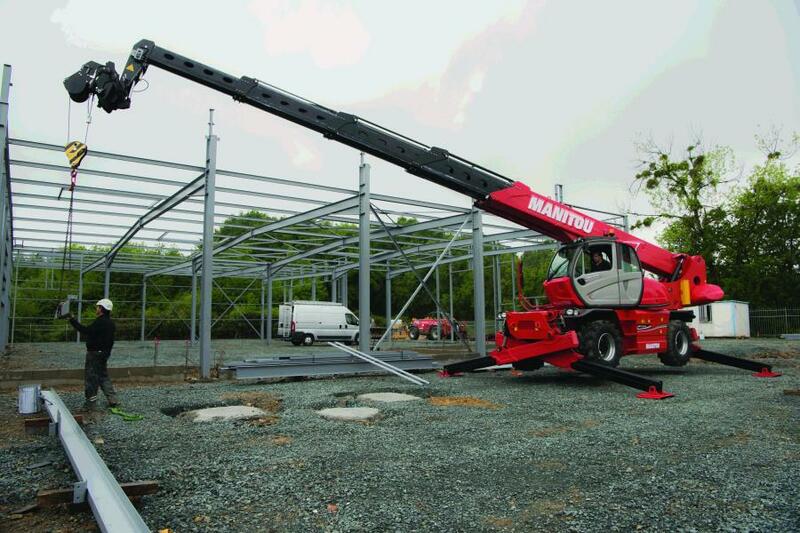 The Manitou MRT 2470 has a maximum lift height of 81 ft. 4 in. (24.7 m) and forward reach of 63 ft. 3 in. (19.3 m). Even with an extraordinary amount of strength, the MRT 2470 still has a compact frame that can easily maneuver through tight jobsites. Both the MRT 3050 and MRT 2470 are powered with a 176-hp Mercedes turbo diesel engine. Rounding out the line is Manitou's most compact rotating telehandler model, the Manitou MRT 1840 Easy. This model was re-engineered to fit a new Tier IV 74-hp Perkins turbo diesel engine. It can lift up to 8,800 lbs. (3,991 kg) and reach a maximum height of 58 ft. 9 in. (17.9 m).